Home / Health / The Possibility Diseases of Vitamin B 12 Deficiency. The Possibility Diseases of Vitamin B 12 Deficiency. 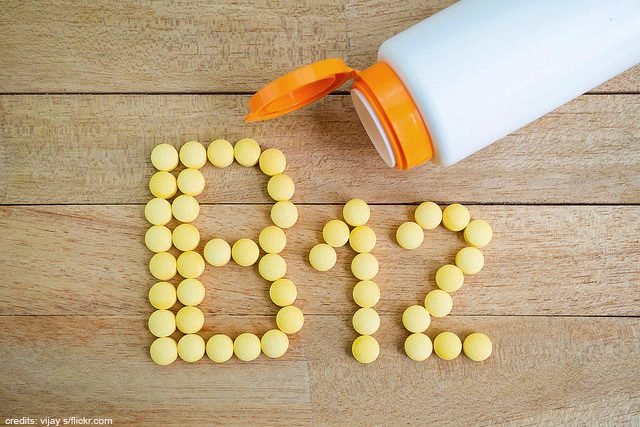 The possibility of diseases of vitamin B 12 deficiency might happen if the body does not get enough vitamin B 12. Some people often assume that consuming fruits is enough to fulfill the needed vitamin intake every day. The truth is vitamins do not always appear from fruits. The body also needs vitamins alike vitamin B 12 that come from animal products like meat, eggs, milk, and cheese. The main role of vitamin B 12 is in the forming of DNA and also red blood cells in the body. Vitamin B 12 deficient bodies usually have health problems in the form of pernicious anemia where the body is unable to absorb vitamin B 12, atrophic gastritis, a condition where the lining of the stomach tends to thin out, or even some intestinal diseases like Crohn's disease, celiac disease, and problems body's immune system. Vitamin B12 deficiency will interfere with many bodily functions, especially in the production of red blood cells and related to nerve conditions. It will trigger the emergence of several diseases. Vitamin B12 deficiency can cause anemia, particularly megaloblastic anemia. Megaloblastic anemia is a blood dysfunction that occurs when the number of good quality red blood cells is less than normal. While the body does not have enough red blood cells to work properly, tissues and organs may not get enough oxygen. The most common causes of this condition are megaloblastic anemia due to a lack of vitamin B12 lack of folic acid in the body. Both of these nutrients are needed to produce healthy red blood cells. When both are lacking, the body's ability to produce red blood cells with good quality decreases. The resulting red blood cells become too large and brittle. These too large and fragile red blood cells cannot get out of the bone marrow to enter the bloodstream, and they cannot deliver oxygen to all body tissues. As a result, body tissues lack oxygen. It will cause the emergence of various symptoms of anemia ranging from weakness, fatigue, headache, to the gums becoming pale. Lack of vitamin B12 is associated with the occurrence of depression. Vitamin B12 and other B vitamins work together to produce body chemicals that affect brain mood and function. Therefore, when the amount of vitamin B12 decreases, this will disrupt the balance of the production of brain chemicals. The condition of lack of vitamin B12 in the body can also trigger nerve problems. The lack of vitamin B12 damages the myelin sheath which functions around and protects the nerves. Without this protector, the nerve stops running properly. This disorder is called peripheral neuropathy. Just a little vitamin B12 deficiency can even affect the overall nervous system work and brain function. Nerve damage that occurs due to lack of vitamin B12 can occur permanently if not treated immediately. The most common symptoms are numbness and tingling in the hands and feet. Lack of vitamin B12 in the body can also trigger disorders of the oral cavity, one of which is on the tongue called glossitis. Glossitis is a term used to describe the condition of an inflamed tongue. If you experience glossitis, the tongue will change color and shape, feel painful, redder, and swollen. Inflammation due to glossitis can make the tongue feel smooth because of the small bumps that should be on your tongue disappear. Vitamin B12 deficiency can also cause burning mouth syndrome. The symptoms are dry mouth, increased thirst, sore mouth, tingling or numbness in the tongue and lips, and a burning sensation in the lips, tongue, gums, palate, and throat. An increasingly severe condition of anemia in people who lack vitamin B12 has the potential to cause digestive problems such as constipation (constipation) and cause abdominal pain. If vitamin B12 continues to be insufficient, constipation will get worse. Intake of foods rich in vitamin B12 must be increased to overcome this impact. For example beef liver, salmon, and tuna. For those of you who are vegan or vegetarian, you may need a vitamin B12 supplement according to your doctor's advice. Also, read The Symptoms Of Vitamin B12 Deficiency.